Pattern Row 1 - 3ch, 1tr into base of 3ch, * miss 1tr, 1dc into next tr, miss 1tr, 3tr into next dc, * rpt from * to * to last dc, work 2tr into last dc. Turn. next tr, * rpt from * to * to end. Turn. Rpt Pattern Rows 1 & 2 in colour sequence as follows. You should have worked 56 rows in all from beginning. 3ch to turn with on the end of the row, 3dc into top of 3ch, working into row ends down the first side of the towel, work 81dc evenly along to next corner, 3dc into corner, working along the cast on edge, work 1dc into each ch to next corner, 3dc corner, working again into row ends up the second side of the towel, work 81dc evenly along to last corner, 1dc into base of 1ch, ss to first dc. Turn. Next Row - Make 1ch, work 2dc into base of 1ch, * 1dc into each dc to corner, 3dc into corner, * rpt from * to * to last corner, 1dc into base of 1ch, ss to first dc on beginning of row. Turn. Rpt last row 3 more times. Fasten off. 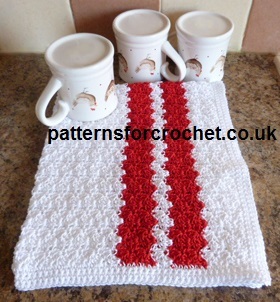 Hope you enjoy this free crochet pattern for a cotton tea towel.